The rumors are correct yet again coming from eagle-eyed C-netizens and the always gleeful to spread gossip C-news. 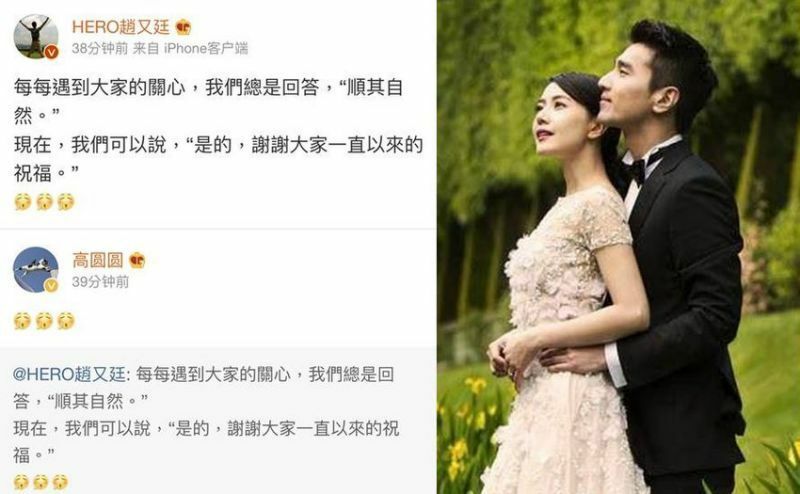 Top married acting couple Mark Chao and Gao Yuan Yuan are indeed expecting a baby, their first child after 5 years of marriage and unending questions about when they were going to create progeny with their enviable visual genes. In March the C-media went wild with news that Gao Yuan Yuan canceled events in the coming months and also released a short video greeting to fans where she was seen only from the chest up. Mark confirmed the happy news with his Weibo post that read “Every time we have encountered people’s care, we have said we will leave it up to nature. Now we can say ‘yes, thank you to everyone who has been sending us blessings this entire time. '” Awwwww, I can’t wait to see sure to be beautiful baby Chao! I am so mesmerized by her beauty. Feel happy for them both. Congratz! Wishing both of you a very happy pregnancy and birth time! She’s so beautiful and elegant…..the Audrey Hepburn of China. It’s like combination of Audrey Hepburn and George Clooney of China. I’d been rooting for them to have a child. I always hope for celebrities to have happiness forever! Good looking couple but man Gao Yuan Yuan’s so beautiful. In the first picture, just the simpleness of her outfit. Wow. Now I’ll try to find some cdrams of her.